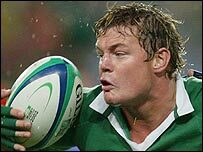 Ireland coach Eddie O'Sullivan has revealed that skipper Brian O'Driscoll could be fit in time to play in the opening World Cup game against Namibia. It had been thought the Leinster centre would miss Sunday's Group D match after fracturing his sinus in a warm-up game against French side Bayonne. O'Sullivan said O'Driscoll took a full part in Monday's training and that his recovery was ahead of schedule. Shane Horgan tested his knee injury by doing some warm-up work on Monday. He is expected to miss the Namibia match but be ready to face Georgia six days later. Recent injury victims Stephen Ferris, David Wallace and Denis Leamy were able to train on Monday.